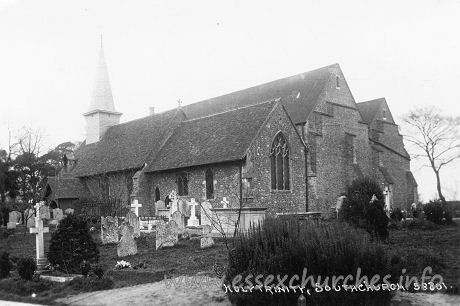 This postcard shows, quite clearly, the east end of the church, following the first phase of enlargement. Notice that the east end of the entire enlarged church is at the same level as the east end of the Norman church. And notice that the finish of the central east wall is the same as the finish as that of the north aisle. The next image shows an enlarge image of the east end.